Cancelled clients are bound to happen. It’s unfortunate and can sometimes cause quite a headache for gym and studio owners. But what if you could make up for those headaches by getting your cancelled members back? Although not always the case, many people cancel based on reasons that have nothing to do with a negative impact the business had on them. It could simply be they didn’t use their membership enough, it wasn’t the right time financially, they were moving, or other personal reasons. Many subscription based companies use tactics to get clients who've cancelled to come back. Subscription based companies and gym or studios have a lot in common when it comes to payment structure, often charging on a month-to-month basis. Even if your fitness business has members locked in for six months or a year, once that time is up, if they do not re-sign, getting them back becomes extremely important. One company that puts a lot of focus on canceled subscriptions is Blue Apron, the meal subscription service. As you can see, they have a really nice call to action, “Restart My Deliveries,” accompanied with some information you might not know about their company, and what’s on next week’s menu. So, what can a gym or studio take from the email above and apply to their own business? When asking cancelled clients to come back, it’s important to highlight the positives of your business and what they're missing out on. Having a preview of a class schedule including some of your most-loved classes would be a great way to get people back in the door. Not being extremely straightforward isn’t the usual way to grab attention, but when it comes to cancelled members, it’s better to take a more sensitive route. The call to action in the Blue Apron email isn’t telling you, “Sign Up Today!” because that wouldn’t be as enticing. 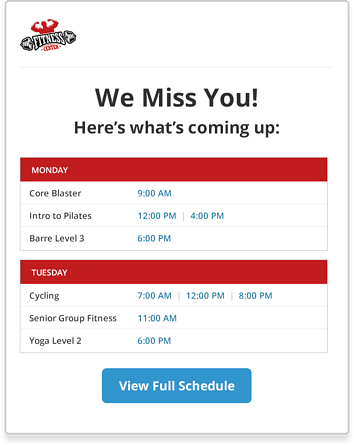 For gyms or studios, using CTA’s like “Workout with us again!” or “Our gym isn’t the same without you.” would make for better initiators of action. What we'd add: A promotion or offer! Give them a push in the right direction with an offer they can't refuse. Just make sure the offer only lasts a predefined amount of time. They need to know that action must be taken quickly. Another subscription company that takes a different approach to reaching out to cancelled clients is Winc, a monthly wine subscription. 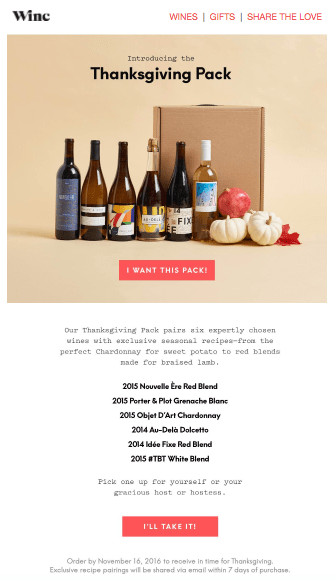 Winc takes a different approach by not asking you to come back or renew a subscription, but instead offers a seasonal or special box that might get you thinking about their company again. It’s also a chance at getting someone in the door with that one box, moving them to continue with a subscription. How can this approach work for gyms or studios? If you are having a really big seasonal special, such as a New Year’s special, send an email out to your cancelled clients that explains the special and why they can’t miss it. When you explain what they are missing, and at a great price, it’s hard to say no. Doing this once a quarter could convince some cancelled members to reevaluate. Be specific! In the Winc email, they list out each wine you would receive. When running a special, explain all of the benefits, all of the classes you’re offering, and more. Whether it be a yoga or Pilates class or no initiation fee, you never know what portion of your gym or studio may resonate with someone. If it’s been awhile since someone has cancelled, you may offer classes or pricing you didn’t offer before that they could take advantage of now. Many successful subscription companies use email to get their cancelled clients back, and a fitness business could take some notes on how they do it and what makes their efforts successful. When you have a system like Club OS, you can set up an email that will automatically send out to someone after they cancel, making this process easier than ever.